When it comes to developing affordable business videos solutions for your company, NetworkVideo has years of experience and will walk you through the process. With an unlimited network of independent videographers, we can shoot and edit just about any type of video your can imagine. Videos are typically one-minute in length. These unique business “elevator pitches” are designed to provide the business owner with an opportunity to describe products and services, in their own words. 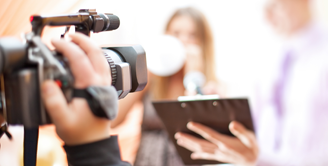 Through video, a business owner can tell their story. We focus on things that are most important to your customers. We talk about your history, your employees, your specials and we do testimonials from your clients. People love videos and statistics prove that video is far more effective than other forms of advertising. Our experienced sales people, come to your office and recommend the type of video and package that works best for your business and budget. Affordable Business Videos – We come to your place of business, create a script, shoot the video of your business, narrate the video, edit it, add music to it and create a wonderful video that you can use on your website, with social media, eblasts and presentations. Picture Showcase Videos – Our least expensive video…We use your business photos, logos, written quotes, charts and graphics to make a complete video. We will write the script, provide the voice and add music to bring your whole video together. Time Lapse Video – Using editing techniques and high-speed, time-lapse video equipment, we can show an entire process in a few short minutes. So whether you are building a kitchen, wrapping a van in graphics, creating a landscape environment that might take hours to complete, we can condense that down to a minute so your clients can get the complete picture. Drone and Aerial Video – The most amazing videos can now be done from above. Using a flying machine above a project, we can capture the most amazing aerial footage. Great for Nurseries, real estate agents and their properties, building projects, equipment suppliers. You name it and we can fly over it. Animation Graphics Videos – Bring your imagination to life with animated videos. Adding graphics to video will help you to create imagery you never thought was possible. How can I use my video for my Business? Boost videos so they can be found online through a Google search. Trust NetworkVideo to put together a terrific video for your business. Call us at 540-341-0202 or fill out the Contact Us Form.